Cold-formed steel (CFS) trusses, also known as light gauge steel trusses, are made from high-quality sheet steel that is fashioned into different shapes by roll forming, or the continuous bending of long strips of sheet metal. CFS can be formed into various steel thicknesses and are fabricated in a manufacturing plant using screws, bolts or welds. 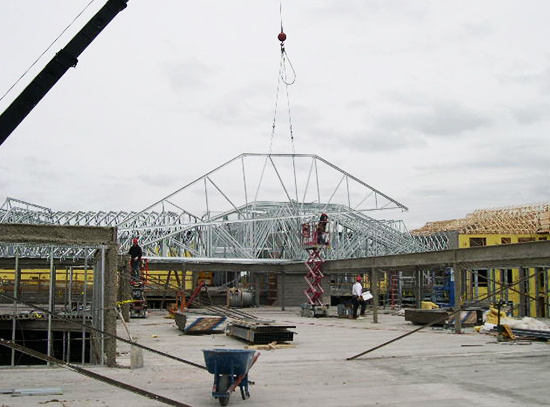 Cold-formed steel trusses are used in all aspects of construction: commercial, residential, educational, manufacturing and hospitality. How does a CFS truss work? The shape of the component members and how they are connected determines the paths that loads take through a truss. Concentric, or symmetrical, trusses allow for the load path to be transmitted through the center of gravity of the member. Eccentric, or asymmetrical, allows for the load path to be transmitted away from the center of gravity. The efficiency of a CFS truss is greatly dependent on the shapes of component members and how they’re connected. How are CFS trusses assembled? Bottom Chord: Inclined, or horizontal member that establishes the bottom of a truss, usually carrying combined tension and bending stresses. Continuous Lateral Brace (CLR): A line of continuous structural members to a chord or web member of a truss to reduce the laterally unsupported length of the Truss member. The CLR must be properly braced to prevent the simultaneous lateral deformation and/or buckling of the series of truss members to which it is attached due to laterally imposed Loads on, and/or the accumulation of buckling forces within, the truss members. Heel: The point on the truss where the top and bottom chords intersect. Overall Height: Vertical distance between bearing and the uppermost point of the peak. Slope/Pitch: Incline of the roof described as inches of rise over inches of run. For example, 5/12 is 5 inches of rise over 12 inches of run. Splice: The location at which two chord members are joined together to form a single member. It may occur at a panel point or between panel points. 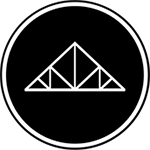 Web: Members that join the top and bottom chords to form the triangular patterns typical of trusses. These members typically carry axial forces.